Marbella, if literally translated, would mean Beautiful Sea, which is exactly what you can see all along its 26 kilometers of coastline from Guadalmina to Cabopino, about 60 kilometers west of Malaga and to the north of Marbella its historical and solemn Sierra Blanca mountain range. Nowadays, the city is internationally known for its jet-set ambient and intense variety of activities offered to its visiting tourists. But even if only being a small part of Andalucia, Marbella has not been exempted of a valuable richness in the Arab culture. Like all of Andalucia, Marbella has been blessed with a long history record going back to the primal Palaeolithic and barbaric Neolithic Ages which left their testimonies in the Sierra Blanca mountain range. There, human remains and prehistoric relics have been dug up and have innocently revealed an important part of Marbella’s history to us. 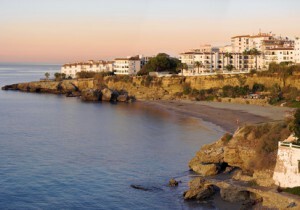 Coming up to more recent times, we have learned that Marbella was founded by the Romans in 206 b.c. and given the name of Saluba. Evidence of this epic are the archaeological remains uncovered here. 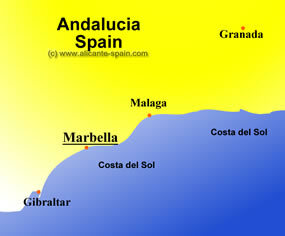 But the weight of marbella’s history lies in the Arab influence which it lived during almost eight centuries (711-1492). During the Islamic period, marbella was a walled-in city which protected itself from invaders which knew of its privileged situation on the coast. Brought back to Christian ism by the Catholic Kings, Marbella did not lose its architectural enchantment nor its Arab character which is still predominant today. Marbella has the big advantage of having been able to keep its old town quarters with its white washed houses and shady town squares full of orange trees accompanied by the sweet smell of jazmin. 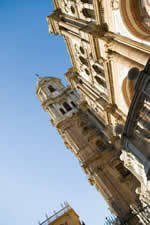 We can find the main square Plaza de Los Naranjos together with the Town Hall built in 1504. Here, we can also see a fountain dating back to the 1600s and the Hermit to Our Lady of Santiago, the first Christian church in this area. But the principal church is Our Lady if the Incarnation from the 18 th c., done in Baroque style but showing an exterior stone style in Rococo. Here we can observe the Great Sun Organ, one of the most important ones made in Spain in the last 120 years. Marbella would not be part of Andalucía if it did not have an Alcazaba or castle, in this case The Wooden Castle ( 9th century), part of the defense system of the city as were the walls around it. We know that it was made with Roman material just by viewing the three Ionic columns. The Cortijo de Miraflores was an old sugar and oil mill, now a reconstructed building made into a museum, an exhibition gallery and reconditioned classrooms for cultural activities. From the 16th century we have the Palace or Hospital of the Incarnation of Bazan , owing its name to Alonso Bazan, mayor of Castillo and of the city. Its asymmetric design is due to the fact that its base was set over three arab houses, using the foundation as its pattern. 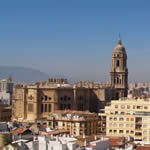 Now, reformed and restored, it houses the Museum of Contemporary Spanish Printing and Engraving. And to add a delightful touch of nature to our visit, the Bonsai Museum, the only one in Spain and recognize das one of the best in the world, located in the Park Arroyo de la Represa. To break up our city visit a bit, we cannot ignore the splendid beaches, astonishing gardens and fantastic parks Marbella has to offer us. If just lying on the hot sandy beaches does not fulfil your vacation needs or you want to change activities every day, no problem! All the water sports your little heart desires at your fingertips. Aquatics such as scuba diving in the deep blue waters , kayaking, lively jet skiing, daring water skiing, entertainable windsurfing, surfing or just a frolicking ride on the banana. If dry land is your delight, you can head for the nearby mountains to go rock-climbing, mountaineering, do Alpinism to get on hand lesson of the magnificent flora and fauna or 4 x 4 jeeps. All these can be done through a selective group of agencies. All of these agencies have specialized instructors who can take you through it all, step by step, teaching and showing us the best way to squeeze every drop of fun and safety out of it. Fun galore is guaranteed even for the younger ones at the different race kart tracks, mini-motorbikes and trampolines. There is still lots more to do. Horseback riding can either be done in the wild mountains or along the breezy beaches, setting free your inner desires. Excellent golfing is usually year-round thanks to the incredible climate Marbella has. Yet there are others who just enjoy looking. There are several boating ports around Marbella, but the most popular and fashionable is Puerto Banus, approximately 6 kilometers outside Marbella. There, you can cast your sight on all kinds of luxurious water-crafts, meet famous celebrities and shop around or just window shop at the top choice brand stores open until the early morning. And within the Open-Air Chores, we can easily include a late night visit to one of the faddish open air pubs or piano bars usually owned or visited by famous people. So much activity deserves a reward and the best one is good food. In the Town Hall Square or in the Plaza de Los Naranjos we can get a bite to eat with a typical hearty breakfast, Marbella style, by either ordering some delicious toast, sprinkled with the finest olive oil or some crunchy fritters and thick hot chocolate. Lunch time is the ideal moment to try all the tasty home-made tapas or hors d’oeuvres so characteristic of this region. Good fresh fish and seafood are usually the base of many of the main dishes, especially sardines on a spit, not to forget the endless varieties of rices and the all so savoury gazpacho( cold tomato soup with small pieces of cucumber, onion and red peppers). 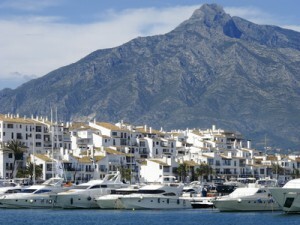 For an unforgettable dinner, Puerto Banus has the most exquisite restaurants and night life ambient. Wherever you go, excellent quality food is always served. Heading up north towards Ronda from Marbella, we enter the Natural Park of Sierra de Las Nieves, well known for its spectacular changing landscape, unlimited types of vegetation and wildlife animals such as the eagle and the mountain goat. Neolithic, Roman and Arab fossils have been discovered here. Ronda is a must on our excursion itinerary. Ronda is located in the heart of the Ronda mountain range, sitting on the River Guadalevín which divides the city in two part; old quarters and the Market area connected by the New Bridge from the 18th century . The Colegiata, an old Mosque temple still conserves its minaret and the arab baths. In the Market area we come across the oldest Bullring in Spain and have to visit the Caves of Pileta with rustic paintings from 25,000 years ago. A quick escape to a quieter residencial area can be done to the nearby town of San Pedro de Alcantara just lying to the west of Marbella. In this same direction we encounter Estepona with incredible views from the coast or a jump over to the other side of Marbella to visit Fuengirola or Mijas. Do not miss out on the local festivities where you can really get the chance to flavor what Marbella Spain is really like. 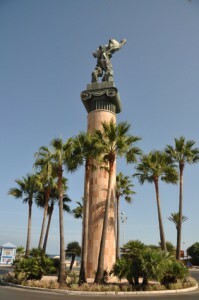 The patron saint of Marbella is Saint Bernabe and the fair in his honor is celebrated during the first 15 days of June, the highlight day is June 11th, the day which commemorates the Christian victory over the Moors. This feast includes a bull fight, musical performances of known group and singers and of course, all day and all night eating and dancing! Whatever your choice may be, good times are waiting for you as Marbella has its door wide open to make you a witness of its existence!